So, you’ve decided that there is something missing in your household. The pitter, patter of little feet on the stairs. Early morning feedings. Late night bedtime snacks. No, I’m not talking about children. I’m talking about the joys of owning a cat. Cats can bring you much pleasure and entertainment. They are wonderful company, particularly for the single person, in whatever stage of life, be it young adulthood or senior years. Stroking a purring cat has been shown to lower blood pressure. Cats are being used as therapy in senior residential settings, as well as for the physically and mentally challenged. Cats don’t require the same level of exercise or space that a dog does, you don’t have to walk them in foul weather, and they will interact with you more than a bird or a fish. All in all, I consider the cat to be the optimal pet, particularly for city dwellers. There are any number of places to acquire a cat, once you have made the decision. You can probably find a friend whose cat just had a litter. You can buy your kitten at a local pet store. You can adopt your cat from an animal shelter. Or, you can contact a breeder and adopt an adult purebred cat that has outlived its usefulness in the breeding industry. At the end of this article you’ll find a list of breeders and rescue organizations who specialize in rescuing purebred cats. Some of the available cats will have been used specifically for breeding purposes, while some will have been in a household situation, and now require a new owner for any number of reasons. Other sources include your local SPCA, animal shelter, and veterinarians. Why Adopt a Purebred? And an adult, at that? Adopting a cat directly from a breeder is a good idea if you know what breed you specifically desire to own. Breeders use these cats during their prime breeding years, which varies depending on breed. Once the prime breeding period has passed, these cats are unneeded. Often times they are simply put to sleep, many at less than five years of age. For many families getting a cat that has been well cared for, when it is past the kitten or rambunctious teenager stage, would be a blessing. These breeding cats have had regular veterinary care and excellent feeding programs. There are, of course, exceptions to this, called ‘kitten mills’ in the trade, but these are becoming more and more rare, due in part to changes in legislation, and also due to the fact that ‘kitten mills’ tend to have higher mortality rates and are therefore less profitable. $ Muscular development may be impaired, as these cats are generally caged through their entire breeding lives. My adopted cat was too weak at first to jump from the floor to the sofa. However, after several weeks of activity, his strength had improved dramatically, and he was easily running and jumping. $ Socialization is often delayed, because breeders are often too busy to spend a lot of social time with the individual cat. Most of the breeder’s time is spent in feeding, cleaning, and grooming, and little time is spent in holding, petting, and cuddling. With my cat, the first thing I noticed was that he was ‘hand shy’. Every time I put my hand down to pet him, he would back away, as if afraid he was going to be hit. I compensated for this by spending much more time cuddling and holding, carrying him around with me in my apartment, and making sure to not move towards him too quickly with my hand. While I cannot say that he ever completely got over this shyness, he did improve dramatically over time. $ Once they bond with you, separation anxiety is common. Although they are used to being left alone for hours at a time, it seems that once they get used to having you around all the time, they want you around all the time. My Himalayan tended to follow me everywhere, slept on my pillow at night, and wanted to be up in my arms whenever I sat down. Since he was so small, I usually let him be wherever he wanted to be, so long as it didn’t interfere with what I was doing. $ Why do you want this particular breed? Do your homework regarding how this cat will fit into your household. If you have some experience with this breed, then you already know much about the characteristics and mannerisms that make one breed a better fit in the household than another. Talk to people who own the breed you’re considering. Talk to your veterinarian about behavioral and health consideration of this breed if you’re not personally familiar with it. $ Is your home big enough? Do you have enough room for this new cat to play, exercise, and sleep, without it feeling like it is still caged? $ Coat type – are you prepared to groom, or have it groomed? Long hair cats don’t shed more than short hairs – it just looks that way. Is this a coat that will shed, or will it have to be clipped? $ Indoor vs. outdoor cat – breeding cats have been kept indoors all their lives. Many are declawed. Are you prepared to keep them indoors all the time? If not, this is probably not the best way for you to acquire a new pet. $ Existing pets – consider how you expect the newcomer to be assimilated into the household. For this, you need to take into account not only the mannerisms and personality of the newcomer, but also of any existing pets. $ Amount of time you have – while adopting an adult cat does not require the same amount of time and energy as adopting a kitten, there will be additional demands on your time to assimilate it into your household. This additional time includes: socialization; setting house rules; acclimatizing to existing pets; grooming, cleaning, and feeding. Your Decision Is Made – Now What? You have decided on the breed. You have the time, energy, and inclination to invest in a new cat. You have contacted a breeder who is willing to meet with you to discuss adopting a cat. When I adopted my Himalayan, I had a friend who knew a breeder. Between them they made most of the arrangements, including the actual selection of the cat, but I suggest you get involved in the decision making process yourself. $ Meet the breeder in person. Ask general questions about the breeding operation he/she is running, as well as specific questions about the cat you’re considering. Visit the breeder’s place of business before you make your decision. Seeing the conditions the animal has been kept in will give you a better idea of what you might be up against regarding physical, social, and behavioral elements. $ Arrange to have the cat neutered or spayed before you take possession. Most breeders will require this, to prevent you from deciding to breed the cat yourself. There are actually at least two reasons why this is a good idea: First of all, since the breeder has decided that the cat is past prime breeding age, it’s probably not a good idea for you to breed it any further. Secondly, the breeders don’t want any more competition than they already have. But I think that the best reason is so that your new cat doesn’t associate you with going to the veterinarian. That memory belongs to their old life. $ Get the registration papers for the cat when you pick it up. (I didn’t do this, and spent the next several months trying to get the papers.) The papers may be needed if you are going to travel to a foreign country with the cat. As well, if you choose to register your name as the new owner, it’s your Bill of Sale. $ Get the medical records when you pick the cat up. (Again, I didn’t do this, and wasn’t able to get them later. Since I’d already bugged the breeder to get the registration papers, I didn’t push for the medical records.) These records are important as an immunization record, or if the cat develops a medical condition where knowing their medical history would be an advantage. Introducing a new cat to your home can be exciting, frightening, or daunting, depending on how well prepared you are. Arrange to pick up your cat in a carrier, cage, or cardboard box with air holes punched in it. There are few experiences in life more frustrating than trying to drive with a cat squished up under the gas pedal. And that’s usually where they try to hide, believe me! When you get home, if there are no other pets in the home already, you can simply open the carrier door, and let the cat come out when it is ready. That may be immediately, or it may take several hours. Don’t fret – it will come out. Show the cat where the food and litter box is as soon as it come out of the carrier. Do this again several times over the next few hours. Cats are smart, have a great memory, and a better sense of smell. They’ll find what they’re looking for, even in the dark. If there are other pets already in the home, leave the carrier door closed for several hours to allow the existing pets time to get used to the newcomer’s smell. Don’t be concerned about snarls and howling between them. They are simply setting boundaries. After several hours, open the carrier door, making sure that there are ample places nearby for the newcomer to hide where the existing pets cannot follow. Again, the newcomer will come out when it’s hungry or needs to go to the litter box. Expect to not see the newcomer much over the next few days. Expect it to run and hide when it sees you coming. Then, when it doesn’t do that anymore, you can be excited and overjoyed at your progress. Expect existing cats to hiss and snarl at the newcomer for some time. My Himalayan had not been around any other cats before I adopted him, having been in his own cage all his life. Because of that, he didn’t have any boundaries to set. However, my existing cat did have boundaries and territory to defend. In my experience, cats seldom fight. They make a great fuss, but most is for show. Leave them alone, and they’ll get over it, normally within three days or so. Be prepared for the newcomer to do things that are not acceptable behavior in your household, especially if you have existing pets who misbehave. Cats are wonderful imitators. Of course, the definition of ‘unacceptable behavior’ can be as varied as the number of households. For me, scratching furniture and carpet; jumping on counters and tables; and running out the front door are all no-no’s. 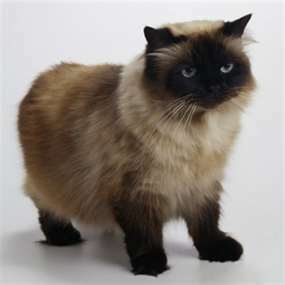 However, I found that my Himalayan was so anxious to please, one loud ‘No!’ was all it took for him to not do it again. Okay, maybe I never completely broke him of the scratching thing, but, two out of three isn’t bad! Once you have your new cat established in your household, sit back and enjoy the pleasure and joy they bring. You will have a wonderful time getting to know them as they get to know you. Their personality has already been established, so in many ways it will be much like getting to know a new friend. You have a little to teach, a little to learn, and much to share. Siamese Rescue Central – an alliance of three shelters in Virginia, Kansas, and Texas. Breed Contacts for Pedigreed Cat Rescue. The following list contains breed clubs whose members are willing to assist in the adoption of pedigreed cats that need good homes. A breed rescue group listing does not constitute an endorsement of these clubs, and is intended for informational purposes only. Please check out the club before you make a decision to deal with it. Email: Anna Sadler Cobeana@aol.com, please use the word RESCUE in the header of the email!